Our pulse technology of Battery Smart Charging Repair Device is the world leader in battery smart desulphation and maintenance solutions of any 2V/6V/8V/12V cell or 36V/48V/60V/72V battery bank, including Flooded, AGM, VRLA and GEL cell, even it is Lead carbon battery. We are involved in researching, developing and manufacturing the most reliable and effective battery life saver in the industry. Worked on industry wide validation that was approved by experts in various fields more than 20 years, and cooperated with the Chinese military until now. Nowadays Electric Bike and Motorcycle is very popular all over the world. But comes the battery problems as well, more than 80% of the batteries breaking down and losing capacity are sulphated. But that can be repaired by our Battery Smart Pulse Charging Restorer. Our lead-acid battery repair device - the most effective battery Smart Charger with Battery Life Saver everyday available for ensuring your EV's battery reliability with any-pulse desulfation as you charging link everyday. 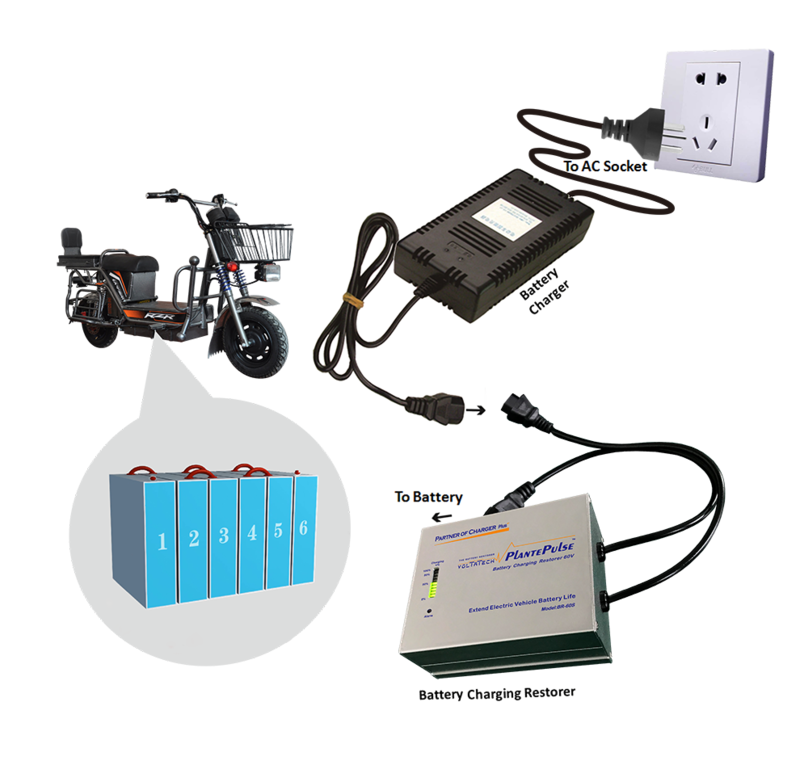 Our 60V40Ah Electric Bike and Motor Battery Restorer is a new generation of high-tech battery life saver developed specifically for recovering electric vehicle battery when it is charging every time. That connection momentarily let your common charger become a Smart Charger with Battery Care and extend battery life of your EV. This Battery Repair Device utilizes the energy from the charger to generate electronic pulse waveform with unique frequency and strictly controlled rise time, which resonance with the thick sulfate crystals during smart charging process to repair your EV Battery bank everyday. Therefore extend battery service lifespan to the maximum. Step 1: Before used, first check the polarity of the charging port on the battery bank, It should be consistent with the input and output polarity of the bottom of the Battery Charging Restorer device to be used, otherwise it will damage the BR-60S pulse charging desulfator device or your charger. Step 4: The BR-60S Battery Smart Pulse Charging Restore Device will automatically measure the battery voltage. After it is normal, please insert the input plug of the charger into the electrical outlet. The BR-60S pulse restorer device will remove sulfated crystals in the charging process. The 60V40Ah Electric Bike and Motor Battery Restorer identified herein is covered by a 2-YEAR warranty valid from the date of purchase. This warranty covers defects caused by faulty components or workmanship, including the labour required for repair in our authorized workshops.This warranty does not cover defects caused by incorrect installation, improper use or abuse. The existence of such causes shall be determined by our workshops technical services. Looking for ideal Smart Charger with Battery Life Saver Manufacturer & supplier ? We have a wide selection at great prices to help you get creative. All the Best Charger with Battery Care are quality guaranteed. We are China Origin Factory of Battery Repair Device. If you have any question, please feel free to contact us.